Summer can take very different forms, depending on where you live. In Berlin, you might want to check the weather forecast before leaving the house to see if you should bring a warmer coat, even in July. In Washington, you watch out for storm warnings since you don’t want to get trapped in some tropical hurricane on the way back from work. In Beijing, you check the air quality. Upon my arrival in early July, I was pleasantly surprised. I had expected smog and humid heat, but the sky was perfectly blue and the temperatures ranged between 26 and 30 C. Since I live across the street from a big park, I seized the opportunity a few days into my stay and went for a jog there. On the way home, I ran past the gym which belongs to our apartment compound and which boasts of being the first “oxygen tank” gym in Beijing. I could see people exercising on treadmills through the windows and wondered what those poor creatures were doing sweating indoors when they could fill up their lungs between the trees and lakes of Chaoyang Park. That was then. 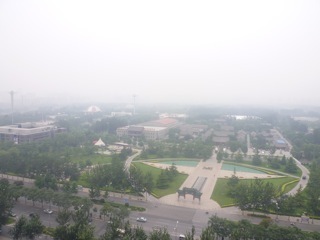 During my second week, the color of the sky gradually changes from blue to grey, and by the third week, I can no longer see Chaoyang Park from our balcony. The whole city looks like someone it dropped into a glass of milk. The smog blocks the eyesight and cuts off the breath. Even drinking lots of water cannot prevent my sinuses from becoming infected. I suddenly notice people spitting in the streets and realize that I had not seen much of that so far – the government has done a good job teaching people to drop this habit. Now I feel like spitting myself. I also feel like turning my lungs inside out to rinse them under running water. I spend most of Sunday at home checking the hourly air quality updates which the American Embassy has been posting on its website, on Twitter and trough a special iphone app since 2009. The number rises relentlessly, from 365 to 403 to 431. According to the U.S. Environmental Protection Agency (EPA), measurements above 150 are considered “unhealthy” for the general population. Everything above 300 is “hazardous”. The EPA measures fine particulates smaller than 2.5 micrometers in diameter. They are considered the most dangerous since they can penetrate deeply into your lungs. Last November, there was a day when the U.S. embassy system could no longer cope. The measurement went beyond 500, the maximum value on the EPA scale – and someone freaked out and posted that the air was “crazy bad”. The embassy later apologized for the “incorrect” terminology. I leave the apartment and take the elevator to the gym. Not that I feel like working out considering my congested sinuses, but an oxygen tank suddenly seems like a great idea. 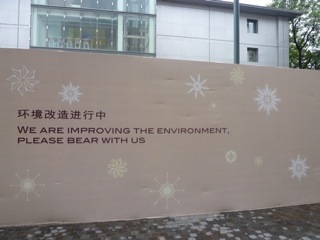 When I step out of the elevator, a cloud of dust comes wafting towards me – it seems like there is construction going on. I make my way to the reception desk and am told that it would cost me 1800 Yuan (280 $/190 €) a month to obtain a membership in this exclusive club. (This makes Holmes Place in Berlin sound like a good deal!) I say that I would like to use the place only as a guest and that I am particularly interested in the oxygen tank. The receptionist smiles awkwardly and says: “The oxygen tank is under construction. But to compensate you for your inconvenience, we can reduce your membership fee.” I thank her and leave. That night, a thunderstorm brings heavy rain, which soaks the city and washes away the bad air. The next morning, the sky is blue, the sun is shining, and my cold is almost gone. 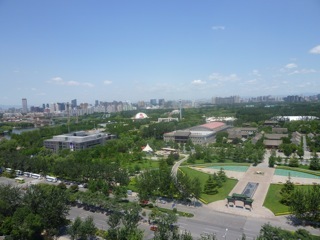 Time to go running in Chaoyang Park – before the next apocalypse.